Do you work at Rasa Sayang? What did you think of Rasa Sayang? I wish I had better things to say considering this is the 2nd chance I've given Rasa Sayang. The only reason I returned was because I had a 2-for-1 voucher, but even with the discount the service was SO abominable this time round that even my first lacklustre visit feels like a Michelin star experience in comparison. It was truly the lunch from hell, where a waitress with about as much social grace as a fungal infection left us angry, frustrated and united in our conviction never to step foot there again. It is a real shame that the 2010 Malaysia Kitchen campaign is having their efforts being spat on like this. The waitress hung up on me when I phoned to book, demanded rudely to see my voucher when we turned up, ended up overcharging us and then had the gall to condescendingly tell my partner he was being too loud and to "cool down" when we tried to clarify matters. On top of that, better more authentic dishes can be found in Sedap Old Street and Malaysia Kopitiam. From reading other online reviews, it is clear that we aren't alone in our fury and frustration at Rasa Sayang's horrible service. Rasa Sayang (Feeling of Love)? Far from it! We went there last night for the 1st time...my husband and his friend. We waited for a while before being seated. We noticed the waiters/owner wanted to create a crowd/wait kind of appearance to outsiders so that people see the rush and think its a great place and get in. Anyways on the food front, very average. Not impressed at all with the non-veg nor the veg which our friend offered. Infact they first served him chicken curry with the roti anyways they had to change it later. They will recommend the chilli crab, pls don't fall for the trap...its sad :( Over all poor customer service and poor food. Definitely will not go back and guess what we left no tip either. Visited on Friday 27th at around 7pm. My wife and I queued inside along with other diners who arrived looking for a table. When seats did become available a number of diners who had arrived after us were seated first. NOT IMPRESSED. When we ordered I specifically stated to the waitress that I did not want spicy food. In case there was any misunderstanding my wife who is Chinese and a fluent Mandarin speaker relayed this message to the waitress. When the meal arrived, it was spicy. NOT IMPRESSED.The chicken that I did have was basically all bone. Under the sauce that it was served in it was almost impossible to find anything to eat. It was relatively cheap, but just as well considering how little there was on it. NOT IMPRESSED. My wife felt bad about things and gave me some of her food. Low and behold the chicken was not even lukewarm. At best it had not been cooked properly. NOT IMPRESSED. When we left, there was no tip left...hardly a surprise under the circumstances. The staff did scowl at us however, as if a tip was a condition of the service. Again, NOT IMPRESSED.The only reason that this rating even gets a 1 star is that I cannot see how to give it nil! The name of this unpretentious little establishment on the edge of China Town means ‘feel the love’ in Malay and, corny as it sounds, you do feel the love that has gone into cooking its Malaysian and Singaporean classics. The big portions and small prices will stir your affections, too. 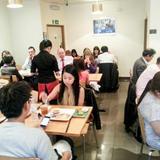 Situated next to the most northerly of Chinatown’s three arches, this is a no-nonsense place of tiled floors; white walls in need of a repaint; budget, blonde wood chairs and unadorned tables; paper napkins; and laminated menus with pictures of each dish. The chance to look out at bustling Soho gives the 45-cover ground floor dining room the edge over the identically decorated and slightly smaller basement, reached by a winding route across worn and discoloured grey carpet. Two low-ceilinged ‘bunkers’ at the back of the basement, each of which could seat eight at a pinch, might, depending on your mood, strike you either as exclusive and fun, or as a bit too much like exile in Siberia. Even at 8 o’clock on a Sunday night, every ground floor table and most of those downstairs are taken, always a cheering indication. The clientele of tourists and regulars is casual, relaxed and civilised. Service is occasionally a tad overkeen but is informative, generally efficient and winningly sweet. The background music might initially seem an odd mix of Western and Eastern pop, but is just as it would be in countless venues throughout Southeast Asia. It’s easy to forgive scuffed paintwork and utilitarian decor for big portions of more-than-competently realised dishes at sensible prices. Fried wantons (£3), which arrive with an unremarkable sweet chilli dipping sauce, are crisp on top, agreeably soft and chewy underneath, and filled with tasty, juicy, minced shrimp, chicken and vegetable with a good chilli kick. Spring rolls (£3) are impeccably crisp and grease-free and their filling – mainly chunky potato and chicken, again with a bold spike of chilli – is a welcome change from the more familiar, Chinese, bean sprout-stuffed version. Roti canai with curry (£6.90) is fabulously flaky, squidgy flatbread, tender chicken and potato in a satisfying brown sauce of coconut, chilli, pepper and coriander. Curry laksa (£6.60) is a hearty, healthy, deeply fishy soup in which float thin noodles, prawns, slithers of scallop and squid, tofu, crunchy green veg and hard boiled eggs. Sambal prawns (£6.90) have a sweet edge and are surprisingly tame, bearing in mind both the fearless spicing of all the other dishes sampled and the fact that their sticky sauce contains countless slices of red chilli. There are plenty of big, juicy prawns and al dente ladies’ fingers, and an agreeable garnish of crunchy, dried shrimp. Kangkong, also known as morning glory or water spinach, is a semi-aquatic green vegetable which grows wild in East and Southeast Asia and beyond. Its flavour is reminiscent of spinach, bok choy and even green beans. Rasa Sayang flash fries it in shrimp paste and serves it still crunchy with plenty of stewed garlic and a strong note of anchovy (£6.50). It’s a brilliant vegetable side which would also do service as a veggie main. All the dishes are underpinned by a hefty portion of perfectly cooked lemak (coconut) rice (£2) which great coconut flavour. Traditionally, Eastern restaurants haven’t taken pudding very seriously but this is changing, and there’s a pleasingly wide selection at Rasa Sayang including classics like bubur cha cha (tapioca pearls and sweet potato in coconut milk) and ondeh-ondeh (little cakes made from glutinous rice flour and rolled in coconut). The equally well-known kueh dada (£3), soft, spongy, rolled pancakes with a sticky filling of desiccated coconut and palm sugar, is a yummy and surprisingly light conclusion to the meal. This is not the place for oenophiles; there is but one red and one white wine, both a mere £2.50 a glass or £11 a bottle, and described simply as “house sauvignon blanc, France” and “house cabernet sauvignon, France”. Both prove unremarkable but perfectly serviceable. Beer lovers are also spared any umming and ahhing by the solitary presence of Tiger at £2.60 a bottle. A nice touch is that bottles of sparkling water (50cl, £1.60) arrive both with glasses containing plenty of ice, and with additional glasses of iced tap water. There are plenty of intriguing soft options, some a little challenging to the uninitiated Western palate, like teh tarik (£1.70), a combination of black tea and condensed milk, or cin cau (£1.60), little pearls of grass jelly in a syrupy drink. Juices include carrot (£2.50) and watermelon (£3). 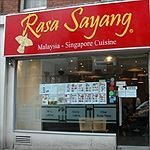 If your pockets are deep and you’re after destination dining and wow-factor decor, go elsewhere, but if three hefty courses of delicious, spicy, assured food with a couple of glasses of wine for £25 a head sounds more your kind of thing, add Rasa Sayang to your address book without delay.